Born about 1490 to Margaret Bourchier and Thomas Bryan, Francis was the oldest of two surviving children. His sister, Elizabeth was married Nicholas Carew. Through his mother he was related to Anne Boleyn and this is most likely why he helped to promote Henry’s matrimonial causes with the French and papal courts. His mother, Margaret Bourchier was half-sister with Elizabeth Boleyn (née Howard) – mother to Anne and wife to Thomas Boleyn. In 1513, as Captain of the Margaret Bonaventure, Bryan started his career. The royal ship was active during the first of Henry VIII’s wars in France. Not only was Bryan a ship Captain but he was also an excellent jouster and an avid hunter who was a close friend of the King and was a lead participant in court entertainments. Henry VIII made Bryan royal cupbearer in 1516, and in 1518 he became mast of the toils and gentleman of the privy chamber. As you can imagine, all these stations kept Bryan very near the king’s person. Cardinal Wolsey tried to rid the court of Bryan when in May 1519, with the backing of the Royal Council banished him, Nicholas Carew (Bryan’s brother in law) and other “minions” from court saying they treated the king with “inappropriate familiarity” and had behaved dishonorable on recent embassy to France. By October of the same year Bryan was back at court and accompanied Henry VIII to the Field of Cloth of Gold in June 1520. It wasn’t until 1528 that he was restored to his post as gentleman of the privy chamber. In 1522 he was knighted for his courage during the capture of Morlaix in Brittany. Bryan served under the Earl of Surrey (Thomas Howard, 2nd Duke of Norfolk). In 1522, he served under Thomas Howard – future 3rd Duke of Norfolk in Brittany and in Scotland in 1523. By 1526, Sir Francis Bryan was Master of Henchman and Chief Cupbearer. It was also the same year that he lost an eye in a jousting match. The eye patch we know him by today had definitely added to his “bad boy” image. Bryan spent a majority of his time at the court of Henry VIII. There he gained the reputation for gambling and dissolute living. These are the things we remember him most by today. In August 1533, it was Bryan who informed the King that he had been excommunicated from Rome. Like most who were close to the king they had an agenda of their own – Bryan was able to further himself by becoming Justice of the Peace in Hertfordshire (among other counties). He also sat for Buckinghamshire in the 1534 session of the Reformation Parliament. When Bryan sensed the King’s change toward Anne Boleyn he was wise enough to pull away from the Boleyn clan. He began a quarrel with George Boleyn, Lord Rochford in late 1534. When all of Anne Boleyn’s relatives were called to court in May 1536, Bryan was on the list of those to be questioned. He was not arrested and actually became Chief Gentleman of the Privy Chamber. 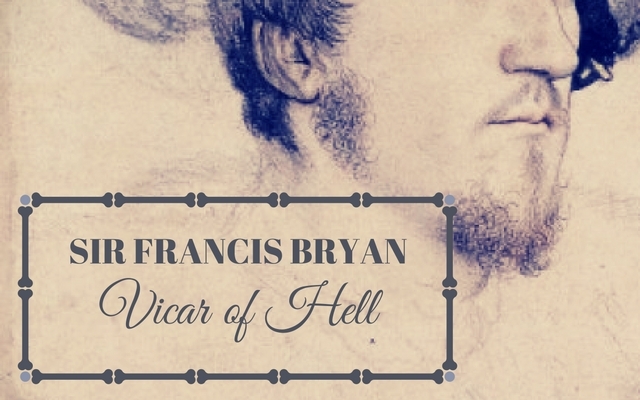 Thomas Cromwell wrote a letter to Stephen Gardiner, Bishop of Winchester where he referred to Bryan as the “vicar of hell.” There have also been claims made that Henry VIII called him by this name and that is possibly where Cromwell got the name from. On the 17 May 1536, it was Sir Francis Bryan who brought word to Jane Seymour of Anne Boleyn’s sentence. After the execution of Anne Boleyn, Bryan was suspected of supporting Lady Mary in being reinstated as Princess. As you can imagine that would have turned off many close to the King at the time. Months later, in the fall of 1536, Bryan found himself in the King’s favor again when he led forces against the Pilgrimage of Grace. Reginald Pole had become a problem for Henry VIII after he married Anne Boleyn – in 1537, the King sent Bryan to convince King Francis I to refuse audience to Pole. Instead he requested an arrangement to have Pole abducted, or killed. Fortunately (or unfortunately) Pole was warned and escaped. Roughly a year before the death of the King, Bryan turned his allegiance from his Howard family to the Seymours – Bryan understood that the Seymours would have great power with their nephew on the throne. It was also the same time the Thomas Howard, 3rd Duke of Norfolk and his son, Henry Howard, Earl of Surrey were implicated in treason – so this would have been a very wise choice for Bryan. After the execution of the Earl of Surrey (19 Jan 1547), Bryan received some of his property and he was also created a freeman of London. In 1548 he married his second wife, Joan Butler, dowager Countess of Ormond. This match gave him much influence in Ireland, where he commanded royal forces as Lord Marshall and won appointment as lord justice, despite the protests of the lord deputy. Sir Francis Bryan died in Ireland on 2 February 1550. His last words were supposedly: “I pray you, let me be buried amongst the good fellows of Waterford (which were good drinkers).” An autopsy was unable to determine a cause of death.